Fifty-two years ago, as Soviet cosmonauts and U.S. astronauts were first venturing into space, another space program was also taking off—in Lebanon. Yes, in the early 1960’s, the country of 1.8 million people, one-quarter the size of Switzerland, was launching research rockets that reached altitudes high enough to get the attention of the Cold War superpowers. But the Lebanese program was more about attitude than altitude: Neither a government nor a military effort, this was a science club project founded by a first-year college instructor and his undergraduate students. And while post-Sputnik amateur rocketry was on the rise, mostly in the U.S., no amateurs anywhere won more public acclaim than the ones in Lebanon. 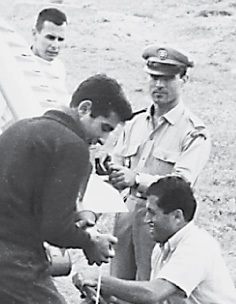 Manoug Manougian, right, with members of the Haigazian College Rocket Society, which he founded in 1960. It later became the Lebanese Rocket Society. But that is forgotten history now, says Manoug Manougian, now 77 and a mathematics professor at the University of South Florida in Tampa. He leads me into a conference room where he has set out on a table file boxes filled with half-century-old newspapers, photographs and 16mm film reels. The Society launched its first “tiny baby rockets” at the mountain farm of one of its members. He did this, he explains, because even as a boy, he loved the idea of rockets. He recalls taking penknife in hand and carving into his desk images of rocket ships flying to the moon. “It’s the kind of thing that stays with you,” Manougian says. Manougian now teaches at the University of Southern Florida, where he keeps newspaper front pages on his office wall. “It was a part of Lebanese history,” he says. 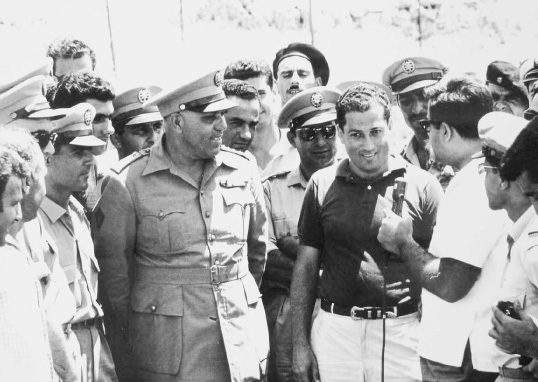 Six students signed up, and in November 1960, the Haigazian College Rocket Society (HCRS) was born. “It is not a matter of just putting propellant in the tube and lighting it,” says Manougian. Former HCRS member Garo Basmadjian explains that at the time, “we didn’t have much knowledge, so we looked at ways to increase the thrust of the rocket by using certain chemicals.” After dismissing gunpowder, they settled on sulfur and zinc powders. Then they would pile into Manougian’s aging Oldsmobile and head to the family farm of fellow student Hrair Kelechian, in the mountains, where they would try to get their aluminum tubes to do, well, anything. “We had a lot of failures, really,” says Basmadjian. But soon enough “it did fly some distance,” Manougian adds. The Cedar launches were commemorated on this postage stamp issued on Lebanon’s independence day. 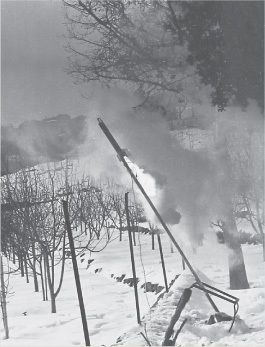 The HCRS began using a pine-forested mountain northeast of Beirut to shoot off the “tiny baby rockets,” as Manougian calls them, each no longer than half a meter (19″). As they experimented, the rockets grew larger. By April 1961, two months after the first manned Soviet orbital mission, the college’s entire student body of 200 drove up for the launch of a rocket that was more than a meter long (40″). The launch tube aimed the rocket across an unpopulated valley, but at ignition, Manougian recalls, the thrust pushed the “very primitive” launcher backward, in the opposite direction, and instead of arcing up across the valley, the rocket blazed up the mountain behind the students. 1963 saw the launch of Cedar 3, a three-stage rocket that allegedly broadcast “Long Live Lebanon” from its nose cone as it rose. Launches at the military site of Dbayea, overlooking the Mediterranean north of Beirut, drew crowds of spectators, journalists and photographers. “We had no idea what lay in that direction,” says Manougian. To investigate, the students started climbing, and on arrival at the Greek Orthodox Church on the peak, they came on puzzled priests staring at the remains of the rocket, which had impacted the earth just short of the church’s great oaken doors. 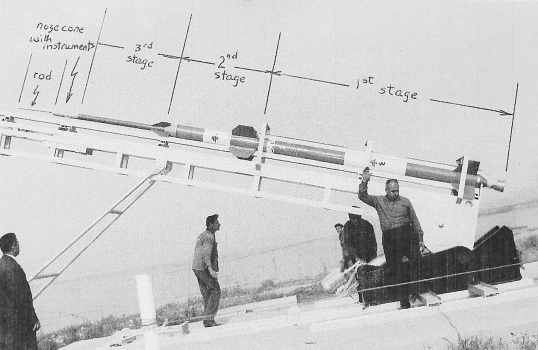 Manougian calculated that, even with the unplanned launch angle, considering thrust and landing point, the rocket had reached an altitude of about a kilometer (3300′), and he adds the bold claim that this was the first modern rocket launched in the Middle East. 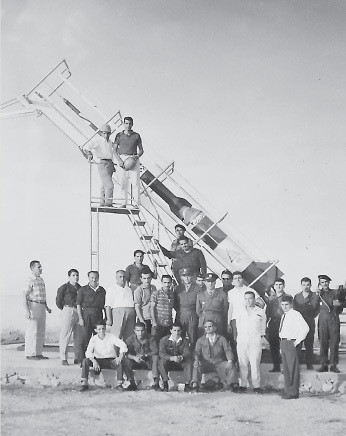 Ballistics expert Lt. Youssef Wehbe (in uniform) began supporting the rocket society in 1961, initially by allowing it access to an artillery range on Mount Sannine. The next day, Manougian got a call from Lieutenant Youssef Wehbe of the Lebanese military. He cautioned that the hcrs couldn’t just go up any old mountainside and shoot off rockets. They could, however, do it as much as they wished under controlled conditions at the military’s artillery range on Mt. Sannine. Wehbe, also in his 20’s, was a ballistics expert, and he was more than intrigued. “Our first success,” says Manougian, came there at Mt. Sannine, where the rocket they demonstrated for Wehbe soared 2.3 kilometers (7400′) into the air. Newspapers got wind of the launches, and they reported that the “Cedar 2C” (named for the symbol of Lebanon) had reached 14.5 kilometers (47,500′). “Obviously, that’s not yet the moon distance of 365,000 kilometers. But the Lebanese aren’t after that, they’re after technique,” stated the report. Under Wehbe’s supervision, HCRS developed two-stage and then three-stage rockets, each bigger than the last and soaring higher and farther. In the papers, the rocket men were portrayed as both brawny and brainy, and they were the talk of Lebanon. A fan club of prominent Lebanese—mostly women—formed the Comité d’encouragement du Groupe Haigazian. In the photos and films of the launches, one can see generals deferring to college kids in HCRS hardhats and eagerly posing in the press photos with them. Even Lebanese president Fuad Chehab invited Manougian and his students to the palace for a photo op. 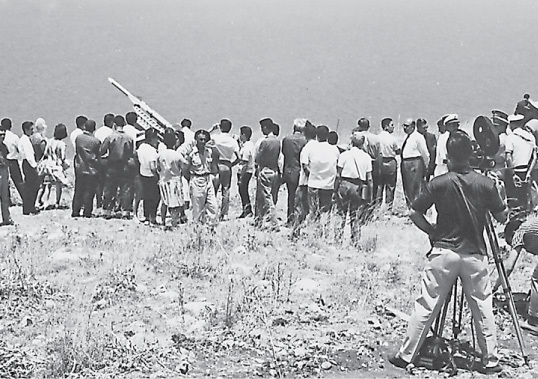 Launches now drew hundreds of spectators to the site overlooking the Mediterranean Sea at Dbayea, north of Beirut, and Haigazian itself became known as “Rocket College.” As the HCRS was now the country’s pride, its name changed to the Lebanese Rocket Society (LRS). Cedar 4 was the society’s most powerful rocket. newspapers claimed that it reached a maximum height between 145 and 200 kilometers (90–125 mi), though the reality was surely much less. For Manougian, however, the rockets and their launches were not about setting records, but about teaching future scientists. One night in 1962, Manougian was taken in the back of a limousine to a factory in the heart of downtown Beirut. There, he was introduced to Shaykh Sabah bin Salim Al-Sabah of Kuwait, who offered to fund Manougian’s experiments generously if he moved them to Kuwait. Manougian hesitated, recalling the commitment he made to himself when he accepted the post at Haigazian: “Don’t stay too long. You only have a bachelor’s degree.” More than a private lab, Manougian wanted to get back to Texas to get his master’s. Before Manougian left for Texas, however, he sat down with Wehbe to plan two launches for Lebanese Independence Day, November 21, in both 1963 and 1964. The rockets would be called Cedar 3 and Cedar 4, and each would have three stages. They would dwarf what went before in both size and strength: seven meters (22′) long, weighing in at 1270 kilograms (2800 lbs) and capable of rising an estimated 325 kilometers (200 mi) and covering a range of nearly 1000 kilometers (about 620 mi), the rockets would generate some 23,000 kilograms (50,000 lbs) of thrust to hit a top speed of 9000 kilometers per hour (5500 mph). From the nose cone, a recording of the Lebanese national anthem would be broadcast. On November 21, 1963, a model of Cedar 3 was paraded through Beirut’s streets to great applause. The cover of the souvenir booklet shows a rocket overflying the city. For Cedar 4, Lebanon issued commemorative postage stamps showing the rocket leaving Earth’s atmosphere. On launch day, 15,000 people showed up, along with generals and even the president. 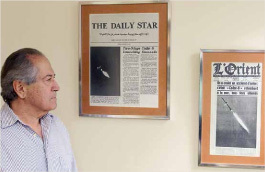 In those years, Manougian recalls, the “rocket boys” were celebrities and Haigazian College was “rocket college.” Above, Manougian answers a journalist’s questions after a launch. 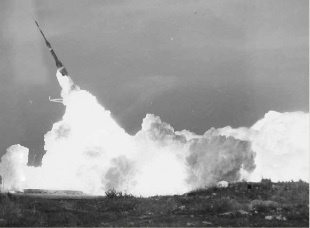 The last rocket, Cedar 10, flew in 1967, after Manougian had returned to the us to earn his doctorate. Then, Cold War politics shut down the program. 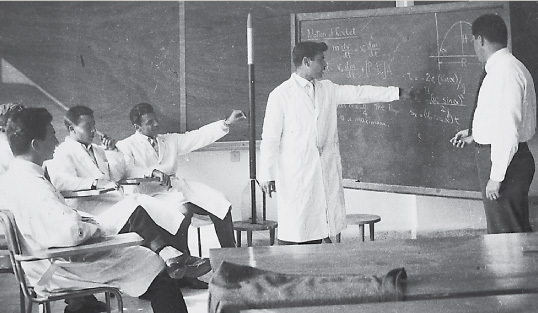 In 1964, master’s degree in hand, Manougian returned to Lebanon, and again collaborated with Wehbe on a few more launches. By then, world powers were interested: France supplied the rocket fuel; the U.S. invited Wehbe to Cape Canaveral. Cedar 8 was the last LRS rocket. Launched in 1966, it was a two-stage, 5.7-meter (18′) rocket with a range of 110 kilometers (68 mi)—a long way from the pencil-sized rockets of five years earlier. “We were launching in the evening, and we put lights on top of the second stage to be able to witness the separation. There were no hitches. It took off beautifully, the separation was fairly obvious, nothing exploded and it landed at the time it was supposed to land. To me that was a perfect launch,” says Manougian, still in awe 50 years on. Under Manougian’s guidance, a new rocket society at USF is exploring rockets that use plasma engines. By 1966 Manougian grew concerned about the extent of military involvement. “I’d accomplished what I’d come there to accomplish. It was time for me to get my doctoral degree and do what I love most, which was teaching,” he says. He left in August, and the Lebanese Rocket Society was no more. But under military auspices, a last Lebanese rocket, Cedar 10, flew in 1967. According to Manougian, Wehbe told him that French president Charles de Gaulle soon pressured President Chehab to shut down the rocket project for geopolitical reasons. Decades of political turbulence followed, and the story of the LRS lay hidden away in Manougian’s boxes. “Soar” is an apt metaphor for all involved. With the HCRS/LRS rocket projects, Lebanon punched well above its weight. Wehbe retired as a brigadier general. 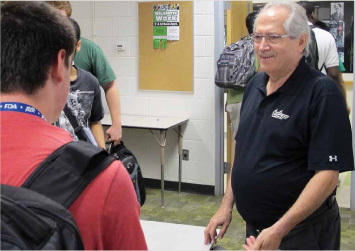 Manougian went on to win teaching awards, and he is loved by his students now as then. Many of the LRS students, and others inspired by them, went on to excel in scientific pursuits. “Most of us come from very humble beginnings. But we had some brains and we studied hard,” says Basmadjian. Sheldon Chad (shelchad@gmail.com) is an award-winning screenwriter and journalist for print and radio. From his home in Montreal, he travels widely in the Middle East, West Africa, Russia and East Asia. He will be reporting from Chad for his next story for Saudi Aramco World. This story originally appeared on page 18 of the May/June 2013 Print Edition of Saudi Aramco World. Tampa, FL – On Wednesday, November 14 over 25 Armenian students, faculty and staff of the University of South Florida (USF) met for the first time at the main Tampa campus to get acquainted and discuss forming an active and permanent Armenian presence at USF. The event began with introductory remarks by event organizer, Fr. Hovnan Demerjian, group introductions and wonderful Mediterranean food generously provided by Harout Topsacalian and Dennis Mousouris of Go Go’s Greek Grille in Tampa. The group then went on to learn about basic resources for being Armenian in and around USF. They heard from long time mathematics professor and Armenian-American activist Dr. Manoug Manougian, followed by Dr.Mark Greenberg from the USF Library Armenian Studies Program. Dr. Greenberg announced an endowment solicited by Dr. Manoug on behalf of the library, which will offer academic and financial help to USF students wishing to study Armenian issues. Fr. Hovnan Demerjian, pastor of St. Hagop Armenian Church in nearby Pinellas Park, offered the full resources and blessings of the church community in support of Armenian students, echoed by the presence of parish council representatives Chuck Sarkisian and Teresa Haidarian. He then spotlighted several programs and events at St. Hagop and beyond to get the most out of being an Armenian student at USF. Fr. Hovnan also facilitated the final discussion, soliciting student ideas and enthusiasm for establishing a permanent Armenian presence on campus, and then handing over the establishment of the club to four capable student volunteers with faculty assistance from Dr. Manoug Manougian. 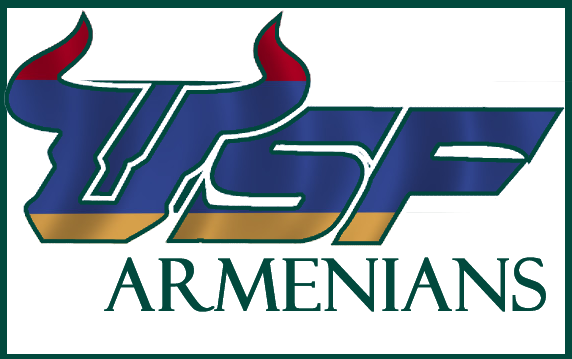 The group hopes to file as an official USF organization by early next semester. If you are interested in joining the USF Armenian Student Club please contact us today!